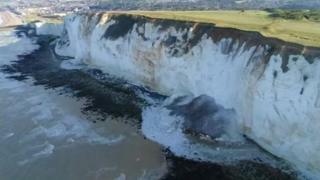 Sections of the Sussex chalk cliffs are being roped off after a third cliff fall at Seaford in 48 hours. Coastguards have warned again that the cliffs are "extremely unstable" and have urged people to keep away. Further warnings also came from police after a woman in her 20s fell to her death further along the coast in what is thought to be an accident. The woman, who has not yet been named, was found at the foot of cliffs at Seven Sisters. Insp John Adams, from Sussex Police, said the woman's death was in no way connected to the Seaford cliff falls. He said there was no evidence to suggest she fell because of erosion to the cliffs. "We'd like to remind people to take care around cliff tops and stay well away from the edge, especially in the light of the incidents at Seaford Head," he added. Officers are working to contact the woman's family. In Seaford, coastguards have said the area is "extremely unstable" - and they said people were seen getting close to the edge after the latest collapse, despite repeated warnings. Spokesman Graham Easton said there could be more cliff falls and people who risked their own lives by getting close to the edge were also risking the lives of emergency rescuers. He said: "This is an extremely unstable area and, without doubt, lives are being put at risk." Experts have said the chalk has been made more brittle by a dry winter. Geologist Prof Rory Mortimore said cracks were opening up on the surface and deep in the chalk. "That is what is going to give us future cliff collapses," he said. Lewes MP Maria Caulfield, who was at a meeting on Thursday to discuss safety measures including roping off the cliffs, said: "There is nothing you can do to prevent a cliff fall from happening. "What you can do is prevent people being injured or put at risk."